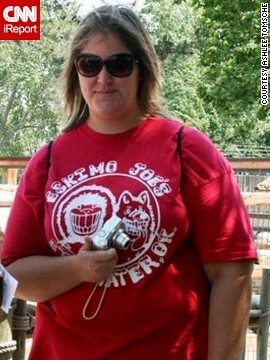 At 21, Ashlee Tomsche weighed 331 pounds. Her body mass index, or BMI, was 44, which the National Institutes of Health considers to be significantly obese. 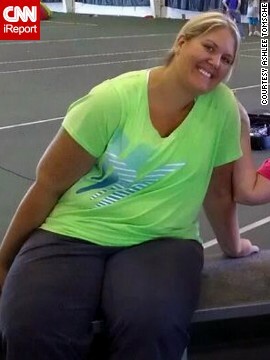 Tomsche had tried to lose weight before by walking on a treadmill, but she quickly got bored. Then in January 2012, she decided to go to her first Zumba class. Tomsche credits her instructor Maria Venegas, bottom left, with helping her stick to an exercise routine. "It's just so much fun," Tomsche says of Zumba. Tomsche's mother, Terri, has also jumped on the Zumba train. They participated in a Relay for Life event with other members from their class in June 2012. 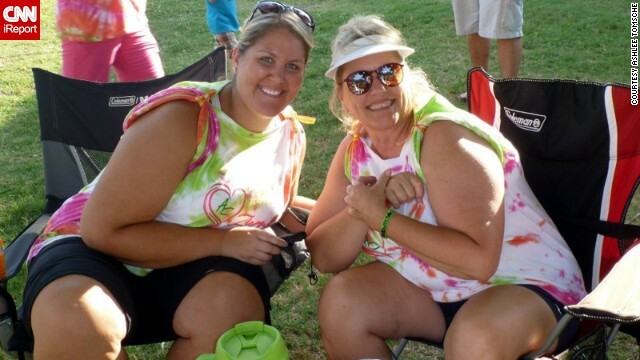 By taking Zumba classes five to six days a week, Tomsche has dropped 123 pounds. Tomsche used to wear a size 26 pant. Now she wears a size 14. Tomsche weighs 208 pounds, but she says she hopes to get under 200 to be in a healthy weight range. A professional photographer on weekends, Venegas took pictures of Tomsche after her weight loss and posted them to Facebook. "People were very surprised and inspired by her transformation," Venegas says. The iReport Awards are here! Go here and vote once per day through May 6 for the Community Choice Award. (CNN) -- Ashlee Tomsche walked into the rec center with trepidation. Images of six-pack abs and neon sports bras from the Zumba infomercials she had watched flashed through her mind. I'm going to look like a complete fool, she thought. With her head down, she walked into the aerobics room and took a spot in the back. She was 21 and weighed 331 pounds. Zumba is a Latin-inspired dance fitness class that blends booty shaking with international music and an intense calorie burn. Since the company launched in 2001, Zumba classes have spread to 14 million people in 150 countries, according to Zumba.com. Tomsche's first class was hard. She had to stop several times to catch her breath. But she came back the next day. And then again the next. 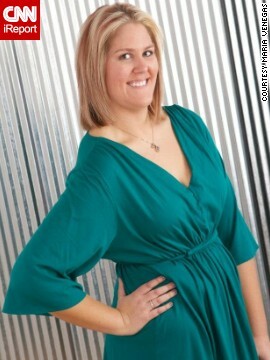 A year later, she had dropped 123 pounds, six dress sizes and more than 10 inches from her waist. "It's just crazy," the Arkansas City, Kansas, resident says. "We're having too much fun." Tomsche was an overweight child, but it wasn't until her best friend committed suicide when she was 16 that she started packing on the pounds. "It really hit me hard, and I turned to food for comfort," she remembers. "It was always there." She indulged in chips and ice cream, and drank soda by the gallon. She would eat an entire pizza by herself in one sitting. Every time she binged on junk food, she felt sick and swore she'd never do it again. But overeating had already taken its toll. She didn't go out because she wasn't confident in her body. Instead she came home right after work to snack in front of the TV. Once in a while she would hit the gym to walk on the treadmill, but it bored her more than empowering her. "I knew I needed to lose weight, but I never knew where to start," she says. "I would try something for a few months and give up." 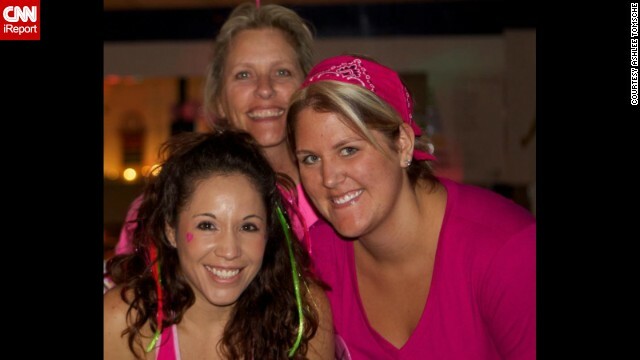 Instructor Maria Venegas remembers when Tomsche first tried her Zumba class. Tomsche wore baggy clothing and seemed unsure in her body. "She would go and sit down about a third (of the) way into class," Venegas says. "But she would get right back up and continue to do what she could." Venegas teaches seven Zumba classes a week in Arkansas City in addition to working as an office manager and professional photographer. "I used to think it was my kids that kept me young," the single mother of two says. "But it has been my venture to become a Zumba instructor that has (been) the fountain of youth, for myself and many others." Venegas creates her own routines, incorporating music from popular artists such as Michael Jackson and Ne-Yo into her classes. In a typical hourlong class, participants burn between 300 and 650 calories. "Every class is always different," Tomsche says. "I'm addicted." 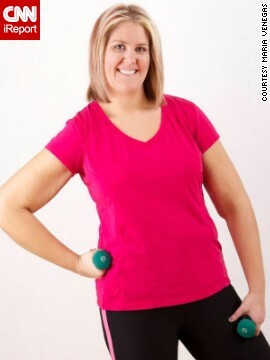 Tomsche loves Zumba so much she didn't even realize at first she was losing weight. But after four months, she had dropped 20 pounds and was getting compliments from her classmates. The attention encouraged her to keep going. "Now (she) walks in with a big smile ... shoulders back and head up high," Venegas says. Tomsche tracks her daily calories on the MyFitnessPal app and drinks protein shakes for breakfast. Giving up junk food has been hard, but she splurges occasionally on thin-crust pizza or Nutella on whole wheat waffles. Tomsche does Zumba five to six times a week and tries to stay active the rest of the day. 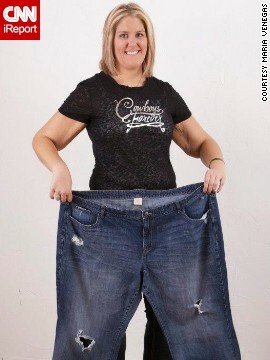 Her hard work has paid off -- she weighs 208 pounds and wears a size 14 pants. "The simplest things in life have become easier," Tomsche wrote in a CNN iReport submission. "I don't feel like I can't breathe when I bend over to tie my shoes. I'm not out of breath when I walk up and down the halls at work, and even sleeping is easier since I don't have all that excess weight pressing down on me." Venegas offered to do a professional photo shoot with Tomsche in January, and they posted the pictures online. Venegas' Zumba classes quickly filled up. She says Tomsche has inspired their small community. Tomsche is just happy she's gotten her smile back. "I never thought coming from a town of 12,000 (people) that I would be an inspiration for anyone," she says. "It's just given me so much confidence in myself." Her advice for others who are struggling to lose weight? Find a workout that you love. "It can be done," she says simply. Have you lost weight? Share your story on iReport. Jen Corn was the heaviest she had ever been. But when her mom and aunt offered to pay for surgery, she said no. Angela Baldwin can pinpoint the day she changed the course of her life forever. Yusuke Kirimoto was always overweight. But relatives calling him a sumo wrestler was the last straw. Robert and Jessica Foster lost a total of 280 pounds after an emotional conversation. See their amazing transformation and how they got healthy. Sarah Evans was miserable on her 30th birthday. She went on to lose 120 pounds. Inspiration can come from unlikely places. Brian Flemming found the will to change his life in a drawing game. Nina Osegueda was 19 and around 180 pounds when she remembers her boyfriend saying the thing no boyfriend is supposed to say. At 27, I weighed 486 pounds and decided to have gastric bypass surgery. You might be thinking: "Oh, you took the easy way out." Not true. In the end, a coupon changed Torrie Creamer's life, helping her drop 145 pounds through grueling workouts. 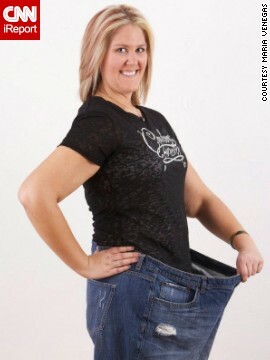 Misty Shaffer lost 100 pounds to shock her husband when he returned from an overseas deployment. Gabi Rose wore maternity clothes for more than 12 years. Now she's a size 2. And her family has slimmed down too.